The schedules, which cover nearly every working day since the midterms, show that Trump has spent around 60% of his scheduled time over the past 3 months in unstructured “Executive Time.”…What the schedules show: Trump, an early riser, usually spends the first 5 hours of the day in Executive Time. 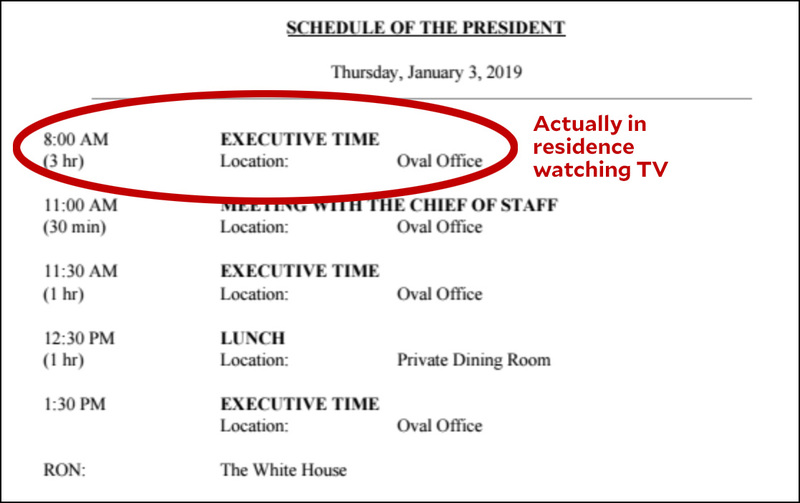 Each day’s schedule places Trump in “Location: Oval Office” from 8 to 11 a.m. But Trump, who often wakes before 6 a.m., is never in the Oval during those hours, according to six sources with direct knowledge. Instead, he spends his mornings in the residence, watching TV, reading the papers, and responding to what he sees and reads by phoning aides, members of Congress, friends, administration officials and informal advisers. This is your president at work, ladies and gentlemen.